I’m very tempted by this Mystic Rose cross body bag from the new range at Paperchase! 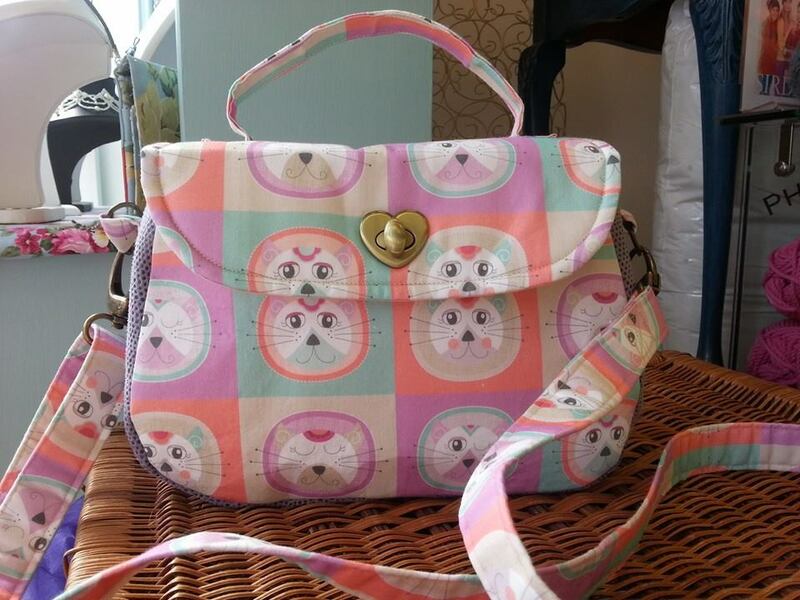 I’ve finally finished my custom vintage style handbag using my cat print fabric! Thanks to Amanda at The Shiney Company, who does these amazing bag-making workshops and has given me the chance to transform my custom fabric into this gorgeous vintage style handbag. If you’ve got a little bit of sewing experience these bags are really not as difficult to make as you might think and there are lots of different bag making classes available. Thanks to Amanda at Shiney Company for taking the photographs. You can see a whole range of the different bags we all made on the Shiney Facebook Page. I’ve been doing a bit of sewing recently and trying to revive some of my old hand-making skills which I haven’t used for quite a few years. I thought it would be a nice idea to make some items in my own custom printed fabrics. I’ve made a couple of cosmetic bags and I’m now making a handbag and I’m quite impressed with the results. 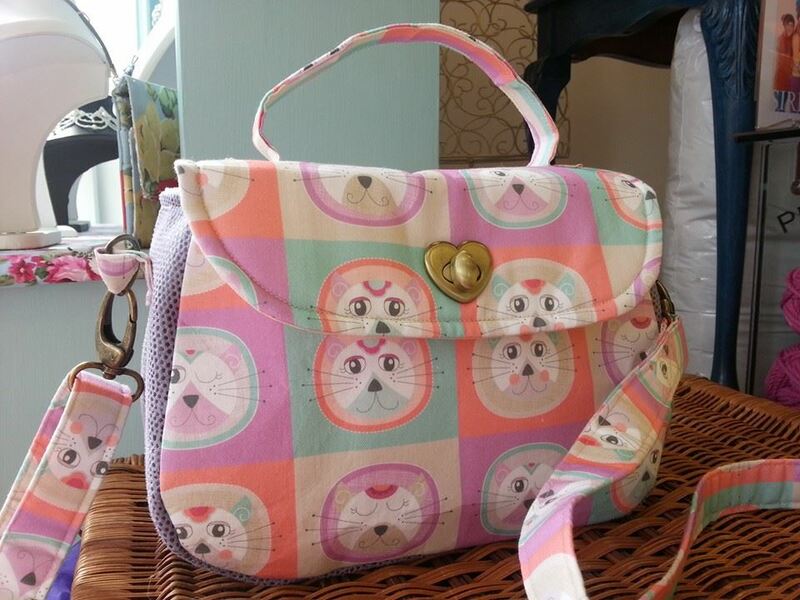 During one of the handbag-making workshops recently where I was using my own cat design fabric printed by Woven Monkey the other ladies were loving my fabric and they asked if it was for sale! The good news is that now – it is! I’ve just opened a shop on Woven Monkey. I’ve only just started and there are many other designs to add, but take a look. 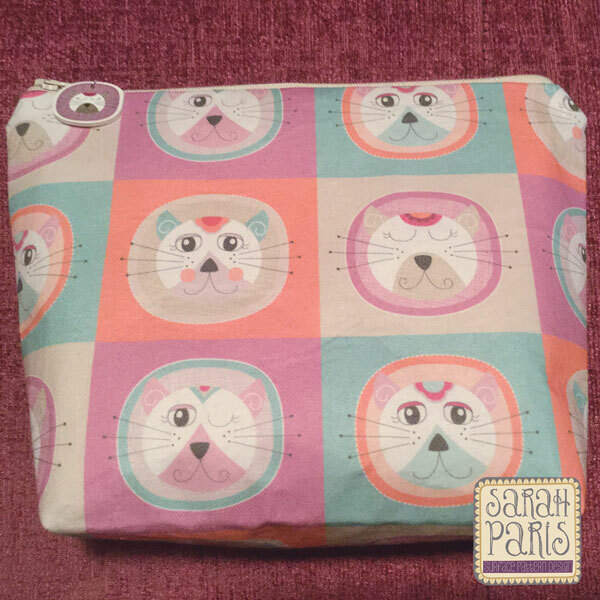 My first Cool Cats Patchwork fabric is now on sale in cotton, cotton poplin and cotton sateen. Perfect for making clothing, quilts and bags. The cosmetic bag sample here is made using the cotton sateen, made firmer with the addition of a medium weight iron-on interfacing. I’m planning to add some co-ordinating fabrics, polka dots, flower prints and other cat designs to this range, so bear with me and keep checking back as they will be added as soon as I can. I’ll be showing the vintage style handbag that I’m making as soon as it’s finished, but that won’t be for a few weeks. I’m really excited to see what it comes out like. You can use this fabric to make hand-made items to sell, but be sure to share with anyone who asks where you purchased the fabric. 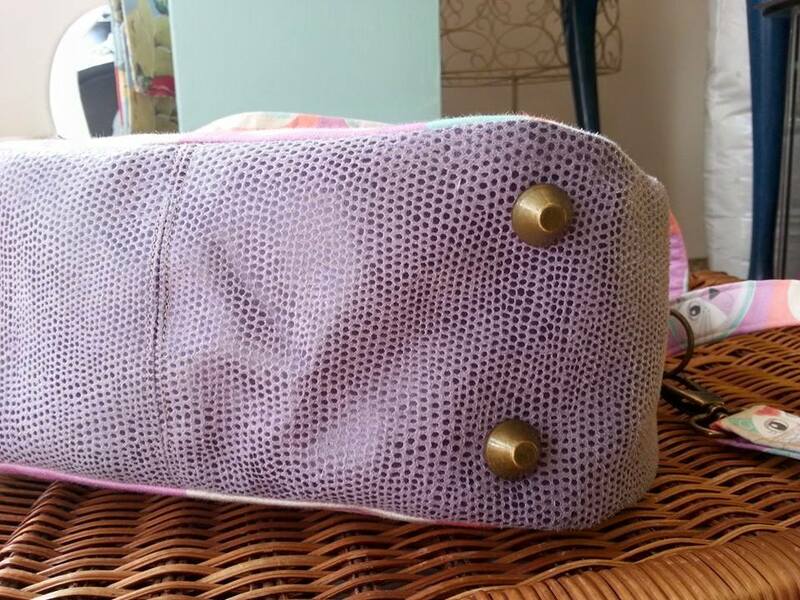 Here’s the sample cosmetic bag I’ve just finished, it’s lined with a peach/white polka dot print fabric that I purchased, but I’ll be adding some of my own co-ordinated fabrics soon. 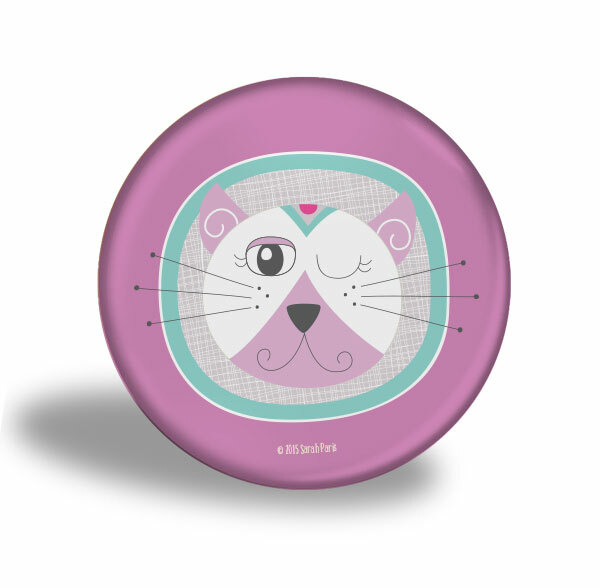 It also has a little shrink plastic cat tag to co-ordinate with the fabric print and I’m planning on getting some matching cosmetic mirrors which should be awesome! Due to the introduction of new EU tax laws affecting small businesses selling online downloadable files, taking effect on 1st January 2015, I have decided to close my online store selling my designs as digital downloads. My Etsy store has now reopened after Etsy sorted out the VAT related issues for sellers, so you can now purchase my printable designs again from them. If you cannot see what you’re looking for on Etsy, please contact me directly using the contact form in the “About” section for any purchase and licensing enquiries, or if you require a commercial license for any existing designs you have purchased. You can read more about the new law and it’s implications HERE. You can still purchase my designs as art prints and on products including phone & tablet cases, laptop skins, cushions, tote bags, mugs, duvet covers, shower curtains, Tee Shirts and many other items in my SOCIETY6 and ZAZZLE stores. I’m really excited. I’ve finally been very busy, and now I’ve got a store on Society6! My first range, by popular demand, is my cute little birdie “Little Wing”. The design is available as framed and unframed art prints, stretched canvases, tote bags, mugs, greetings cards, iPod and iPad cases and skins, laptop cases and even shower curtains! I love the shower curtains, for those of you who, like me, don’t go for conventional greens and blues in the bathroom. If your bathroom has plum, purple, pink or even acid yellow, then this is the shower curtain for you! Click below to see a new range of products available online in my Zazzle store! Currently there are media cases, folio cases, iPad sleeves, iPad cases, accessory bags, clutch bags and cushions in a selection of designs including mod retro florals, moody blue geometrics PLUS some fun and funky new character designs. I’m off to Summer School!